Oh, is there anything better than a good before and after home renovation project? While the dust of remodelling, rainbows of paint swatches to choose from and the endless possibilities of an empty room may not appeal to everyone, we’ve certainly been bitten by the home design bug. 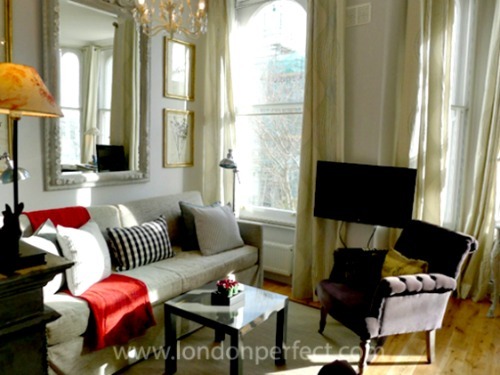 It was amazing to watch the transformation of the charming Churchill vacation rental in Chelsea from a dated two bedroom flat into a charming, comfortable and welcoming home in London. Come along and take a look at the before and after photos to see the full transformation of the Churchill in Chelsea! Before: This was the view when stepping into the Churchill. So dark and not visually appealing! When we first stepped into the Churchill we knew the space had promise, but it was hard to see at first. The first impact upon opening the door was the entrance to a tiny second bedroom straight ahead and the master bedroom to the right. The beautiful light in the master bedroom became the driving force behind a huge – and we mean massive – rearranging of the apartment’s floor plan! But first, let’s take a look at the new entryway, which is decorated with an antique style dresser, charming arched mirror and colourful accents. What a difference … from dreary to warm and welcoming from the moment you step in the door! After: Stepping into the entryway of the Churchill leading to the sunny living room and kitchen! 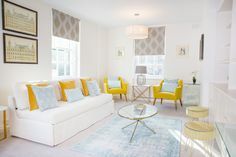 Inspired by the sun and large windows in the former bedrooms, we transformed the areas into a lovely open plan living room, kitchen and dining area. Just take a look at how it happened! 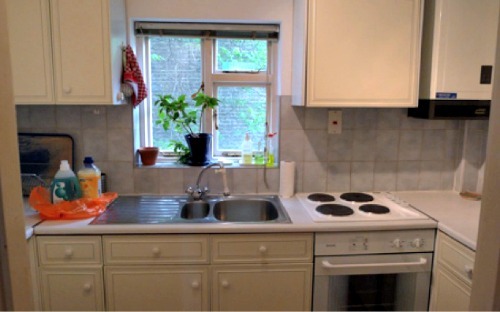 Before: The large windows inspired us to transform this space into a sunny kitchen and dining area! When we walked into what was previously the master bedroom and saw the huge bay window overlooking a charming tree-lined street in Chelsea, we knew this area just had to be opened to create a kitchen and dining room area where guests could enjoy the light and picture perfect London views. The results were everything we hoped for, and now the Churchill has a gorgeous kitchen with comfortable dining area and charming desk space near the bay window. What a transformation! The beautifully remodelled kitchen features lovely new appliances, including a full size refrigerator with freezer, dishwasher, oven, stovetop and microwave. The white French country style cupboards brighten the room. It’s such a sunny and happy spot to start your day in London! Plus, the new built in lighting below the cupboards, above the oven and from the antique chandelier mean you can create a warm and relaxing setting for dining at home in the evenings. 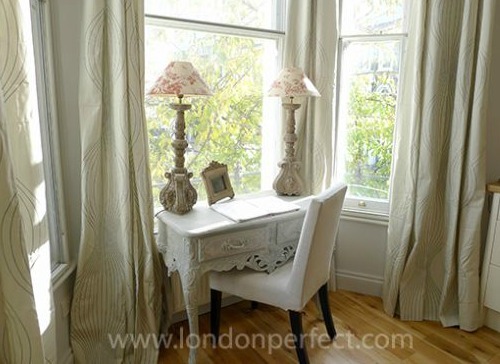 Just beyond the dining area there’s a pretty desk with chair and antique style lamps sitting in the nook of the bay window. Enjoy writing postcards to family and friends, set up your computer to take advantage of the free wireless internet or plan your next day’s adventures in London! We were thrilled with the transformation of the old master bedroom into the sunny kitchen. It’s now a comfortable and cheery space where guests enjoy relaxing and lingering over home cooked meals in the evenings. 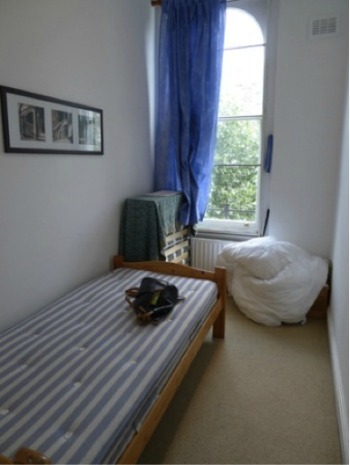 Take a look to see what happened to the second bedroom next door! 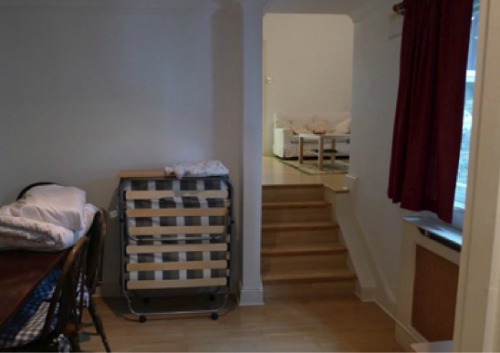 While the apartment was originally a two bedroom, the second bedroom was so small that once you put a twin in there it felt claustrophobic. We took down the wall between the bedrooms and opened up the second bedroom to create an open plan living room with the dining area and kitchen next door. 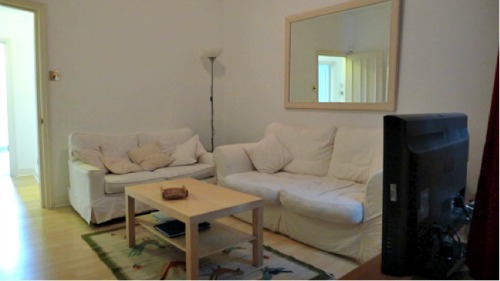 Now it’s all one comfortable space for relaxing at home during your stay in Chelsea! We love open plan floor designs when staying in a vacation rental because you can enjoy time with family and friends during your stay. 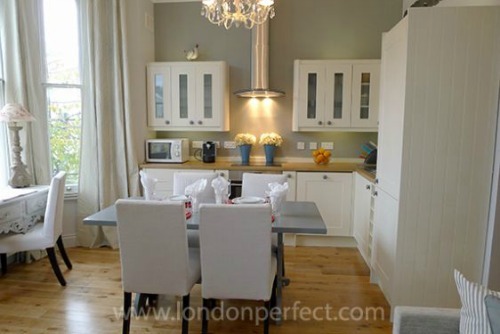 While the kids watch TV you can prepare dinner nearby, or sit around the table and share stories of your day in London with good friends over a glass of wine. 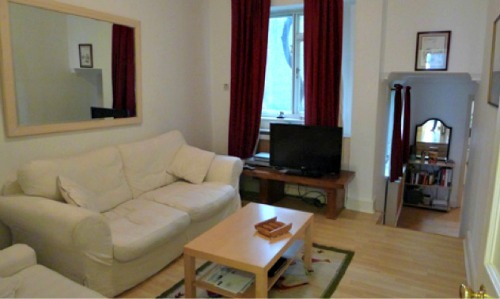 However you use the space, it’s lovely to have a comfortable living room and dining area for relaxing. 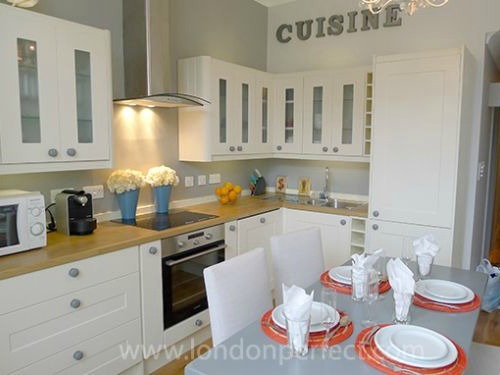 The little touches make the biggest different in a home remodelling project! 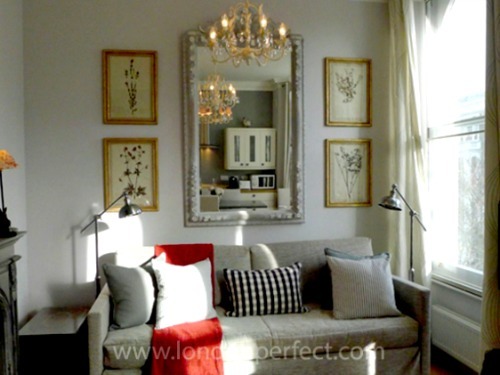 For the living room we selected a comfortable sofa and grey chair along with antique pressed flower prints and a large mirror to reflect the the pretty chandeliers. After all these changes, the Churchill now offers a beautifully transformed kitchen, dining area and living room. But that wasn’t the end of the project. We had to change around the rest of the apartment for the two bedrooms and additional bathrooms. Old Bathroom Updated to Create Two Bathrooms! To say the bathroom at the apartment was outdated was definitely an understatement. 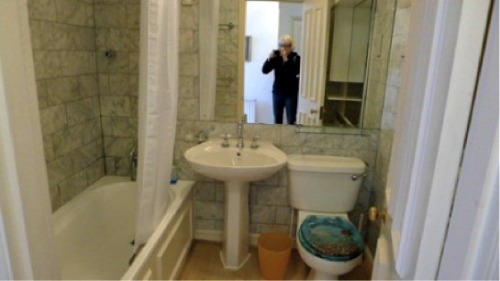 We focus special attention on the bathrooms when we’re working on remodelling because we know how much having plenty of bathroom spaces matters when choosing a comfortable vacation rental. Instead of one large bathroom, we chose to create a full bathroom with a glass enclosed shower, sink and toilet and right next to it to add an additional powder room with toilet and sink. 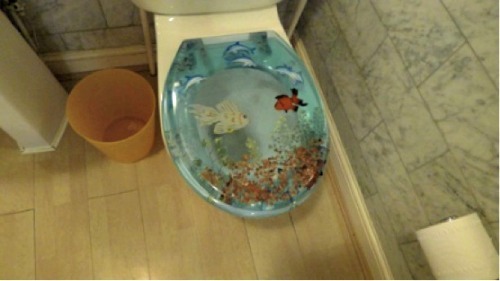 Oh, and the toilet seat cover had to go, too. Sometimes when remodelling it can be hard to choose what stays and what goes. And then sometimes it’s very very easy! 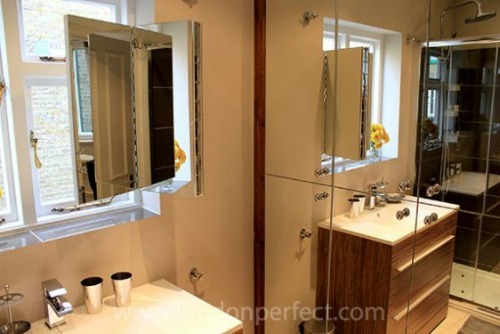 After the remodelling the bathroom now features a nicely sized walk-in shower that is glass enclosed, a sink basin with storage below, heated towel rails and a toilet. The beige tiles also created a brighter and warmer setting than the previous green tiles. Just next to the bathroom we added a powder room with toilet and sink. This allowed the apartment to have two toilets, which is a great feature for a two bedroom apartment! After: From one bathroom to two full bathrooms with the additional powder room! 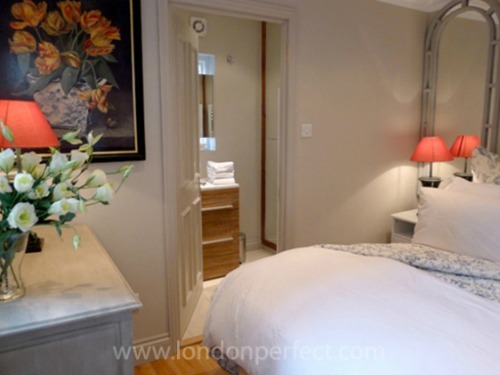 During the remodelling we also added an en suite bathroom in the master bedroom, and with the new powder room that means the apartment now has two full bathrooms. 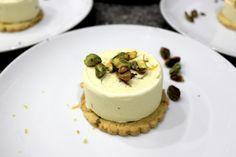 It’s an update that guests appreciate during their stay at the Churchill! And now … what to do with the former living room that was oddly placed right in the center of the apartment? 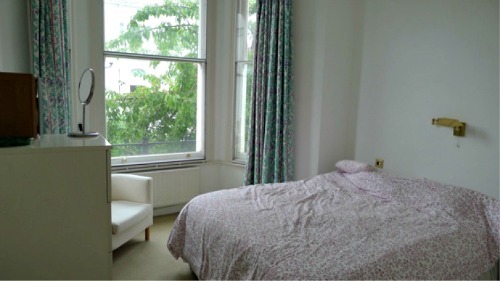 It was closed off to create a corridor and a second bedroom with room for two twin beds. 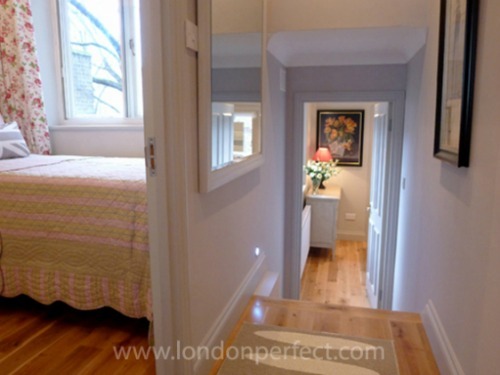 This was a major change, but the results were lovely and created a larger second bedroom and a nice corridor leading down to the new master bedroom below. 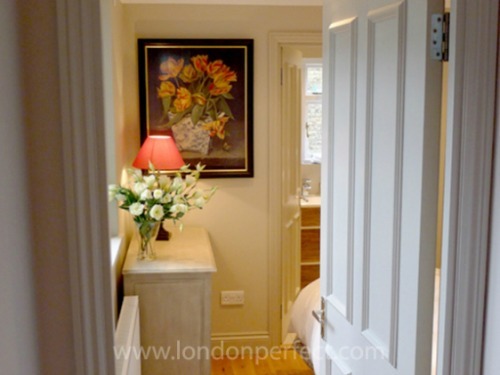 Instead of this large space lit only by one window, we transformed the living room area into a second bedroom, adding a partition wall to create a corridor leading down to the new master bedroom and en suite bathroom. 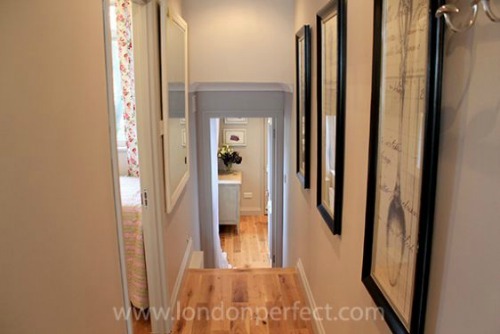 With new flooring and beautiful decorative touches, the new corridor now leads from the apartment entryway down to the second bedroom and then down five steps to the new master bedroom with en suite bathroom. Come along and take a look at the changes! After: The living room was enclosed to create a second bedroom and the corridor leads to the new master bedroom with en suite bathroom! Lighting can make all the difference, and we added plenty of lights in the hallway along with clever night lights near the base of the walls. In the end, the hallway is now brighter than the open room before! 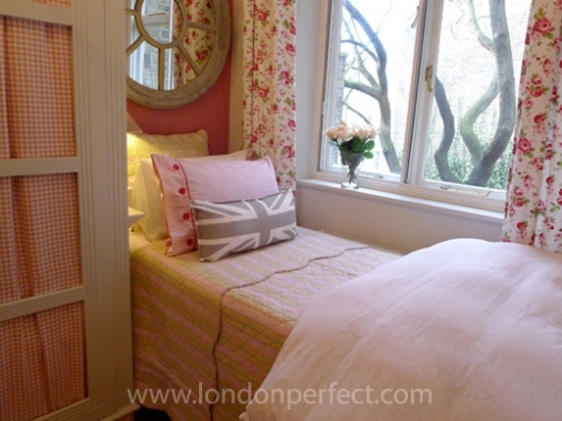 The new second bedroom is absolutely pretty in pink! 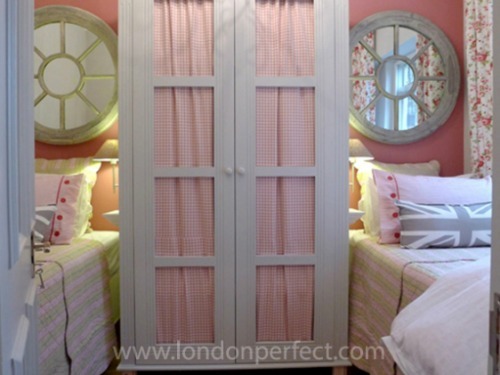 It has a large window, two twin beds and a custom made wardrobe with gingham fabric for storage. 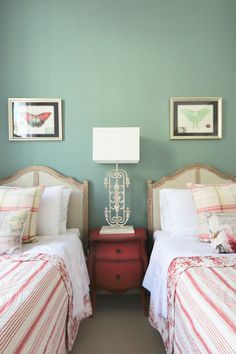 We love the two circular mirrors and the raspberry coloured paint that picks up all the colours in the bedding and curtains. 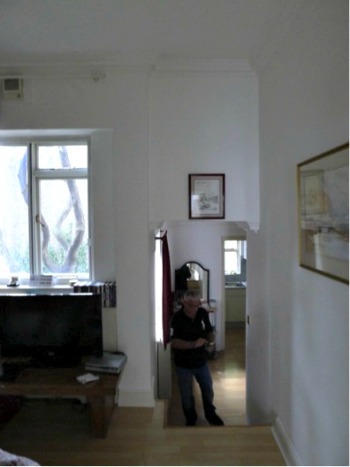 Before Depressing and dark living room! 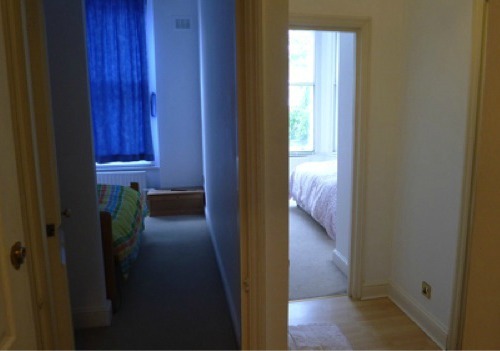 There’s just no comparison to the tiny and dark second bedroom before the renovation! 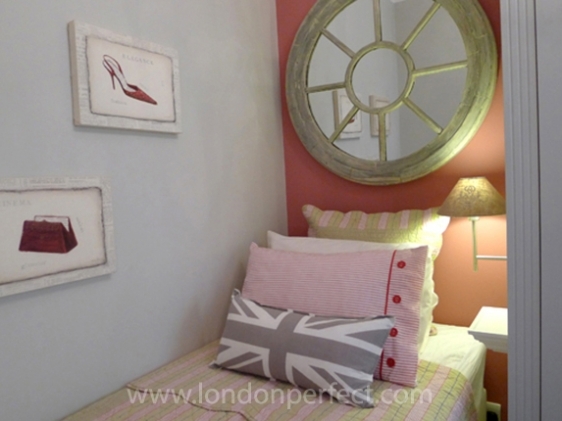 Now it’s a charming spot for relaxing, reading in bed with the bedside lamps and enjoying a comfortable stay in London. 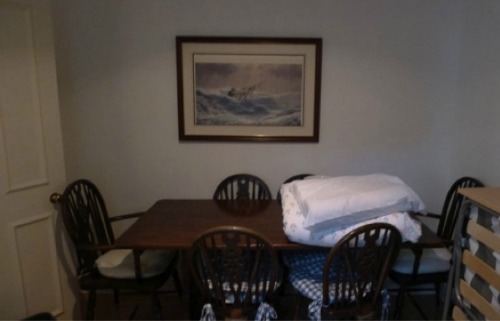 Before: The dining area was dark and unappealing and the adjacent kitchen tiny! With a dull paint color, deep red curtains and dark furniture, the dining area at the apartment was desperately in need of some TLC. But it wasn’t destined to be a dining room any longer. Out with the table and extra furniture to make way for a beautiful new master bedroom! The after results were remarkable for the master bedroom! When you enter the room you can already feel how much brighter it is now with lighter paint, new furniture and plenty of mirrors to reflect the light from a large window. 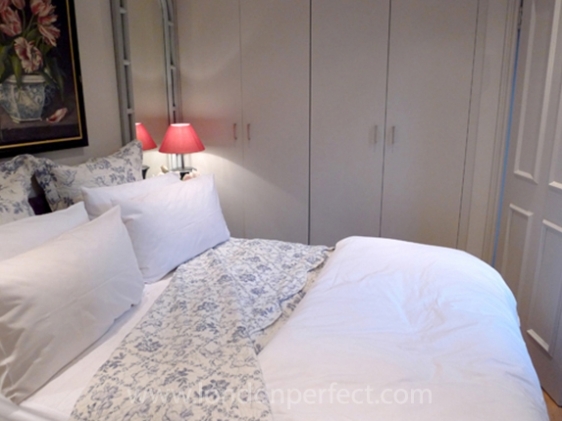 The master bedroom now has a lovely queen size bed and one whole wall of built-in wardrobes for storage. One of the best features is the new en suite bathroom just off the bedroom, which has a sink and lovely walk-in shower! 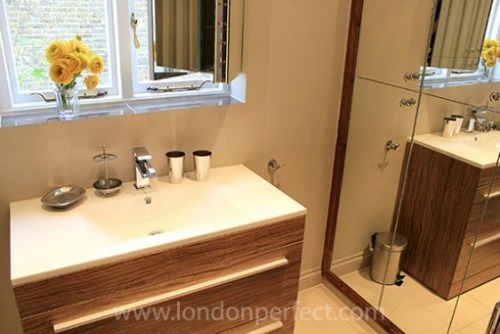 But to take a look at the new en suite bathroom, we have to show you what was there before. You won’t believe it … the kitchen! Seeing the tiny kitchen area we knew it just wouldn’t work for a comfortable two bedroom vacation rental. Not only was the space small, but everything needed to be replaced! 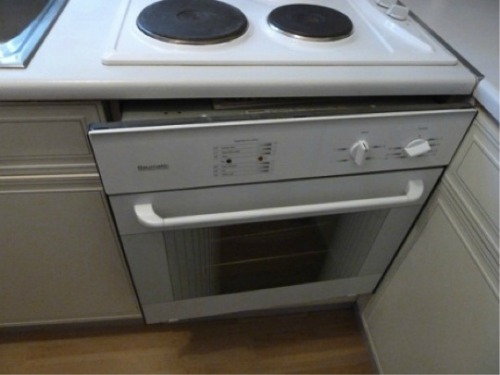 Before: New oven … check! After transforming the dining room into a master bedroom, it was a natural choice to create an en suite bathroom at the Churchill. Now when you step in you’ll find in the same place a sunny bathroom with shower and sink and even a separate washer and dryer! After: The kitchen became a beautiful en suite master bathroom! The en suite bathroom now features a lovely walk-in shower with rainwater shower head and flexible shower head. 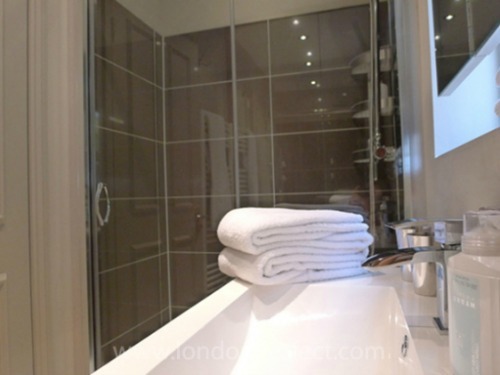 A heated towel rail nearby means you can enjoy fluffy warm towels when you step out of the shower. We loved the natural light from the window in the old kitchen, and we didn’t want to loose that while changing the space into a bathroom. To solve the problem we had a clever folding mirror made that opens across above the sink. Simply open while you’re getting ready in the morning and then fold it closed to let the nice light shine in. We took advantage of the plumbing from the former kitchen to not only add the shower and sink in the master en suite but also a separate washer and dryer. They’re hidden away behind the large mirror paneled doors in the bathroom. 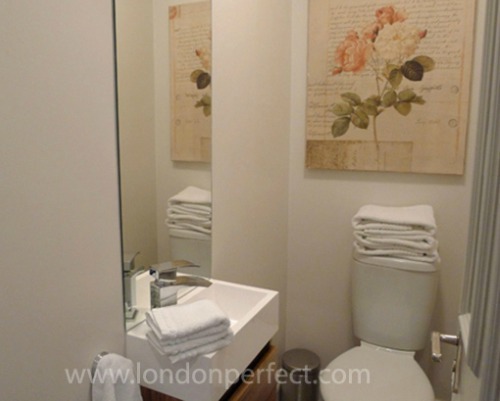 It’s a great feature to have a full size wisher and dryer in a London vacation rental. Knowing you can throw in a wash during your stay means you can pack lighter and not have to worry about those annoying excess baggage fees. Oh, and you’ll have room for all your souvenirs from shopping in London, too! Enjoy a Stay at the Churchill in Chelsea! 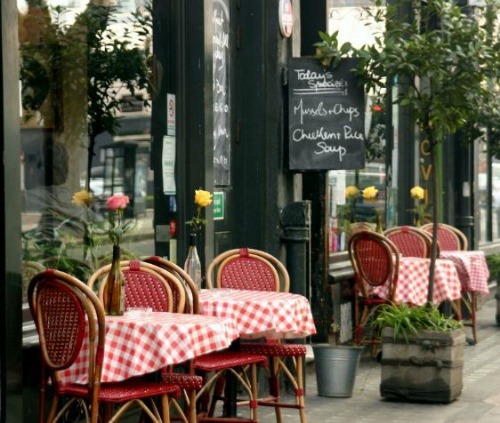 Discover the charming neighbourhood around the Churchill – including the famous Troubadour Cafe nearby! To see more photos of the final results of the Churchill transformation, visit the Churchill to see the slide show and all the apartment details. The Churchill is located in Chelsea near Old Brompton Road and Earl’s Court, which is a lovely residential neighbourhood with easy access to South Kensington, Notting Hill, great shopping along Fulham Road and the Beach and just a short bus ride from Sloane Square and King’s Road in Chelsea. Surrounded by great restaurants, such as the Troubadour in Earl’s Court, classic English pubs and fun shops, the Churchill offers a comfortable and stylish stay in Chelsea. 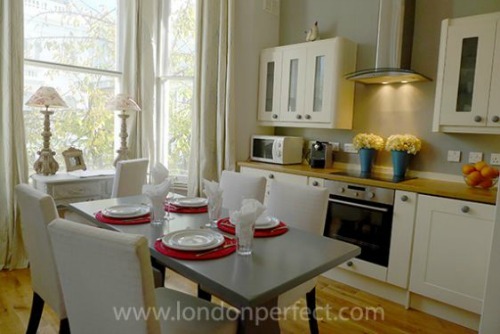 Simply contact us to find out more about renting the Churchill for your holiday in London! NEXT: Springtime Fun – Easter in London! Posted on Tuesday, March 12th, 2013 at 5:47 pm in Home Decor. You can follow any responses to this entry through the RSS 2.0 feed. You can leave a response, or trackback from your own site. 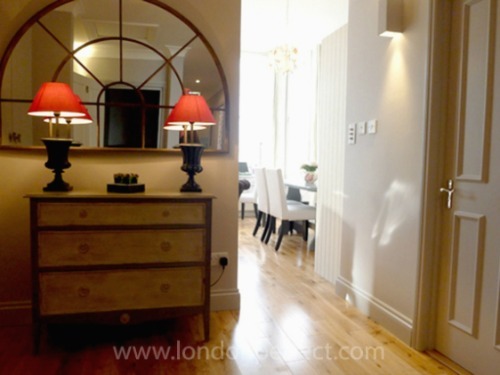 The Perfect Home Away From Home in Chelsea Gorgeous Mews Home for Sale in Chelsea Introducing the Chester in Chelsea Introducing Our New London Perfect Vacation Rentals! It is absolutely gorgeous. What a fabulous renovation!